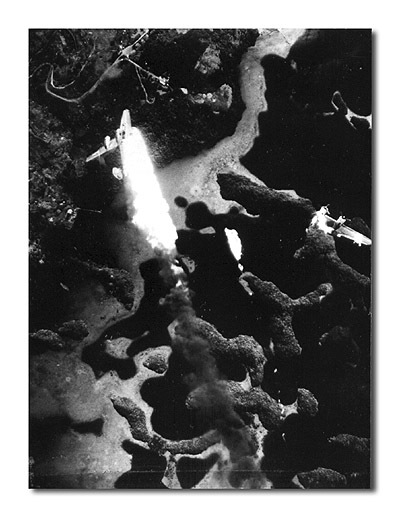 This brand new 7th AAF B-24M, airplane # '058, also nicknamed "Brief", was on a routine bombing mission to Koror from Angaur when, on 5 May 1945, AA fire hit the left wing. Within seconds, this "milk run" turned into disaster. The wing separated and only one crewmember parachuted out. All the rest died, including a cook who had gone along for fun. 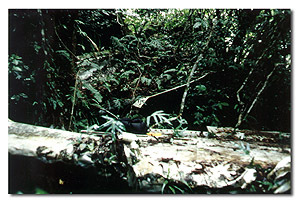 The wing landed in the jungle on a small island, Iberor, near Koror (Picture 12). The fuselage landed in a mangrove swamp along side of Koror. Debris still sits in the swamp at the base of the Nikko Hotel, a favorite hotel for Japanese scuba diving tourists. The navigator, Lt. Wallace Kaufman, was captured while still in the water. Records from the Japanese War Crimes Trials, held after the war, graphically tell what happened to Lt. Kaufman. General Inoue decided that it would be good for morale to behead the navigator and bestowed the honor to the unit commander who shot down "Brief". Although the young officer later testified he nearly fainting, he managed to carry out the order with the help of an experienced swordsman. One can only wonder what Lt. Kaufman's last thoughts were, knowing that the rest of his unit was safe and less than 30 miles away. The executioner and two others were sentenced to 25 years in prison after the war, but were pardoned after seven years. Of note, several other American aviators and crew members are suspected of being captured during the various Palau air campaigns; only two American prisoners are reported to have lived long enough to be taken away by ship (they were never heard of again). All the rest have simply disappeared and no records appear to remain.